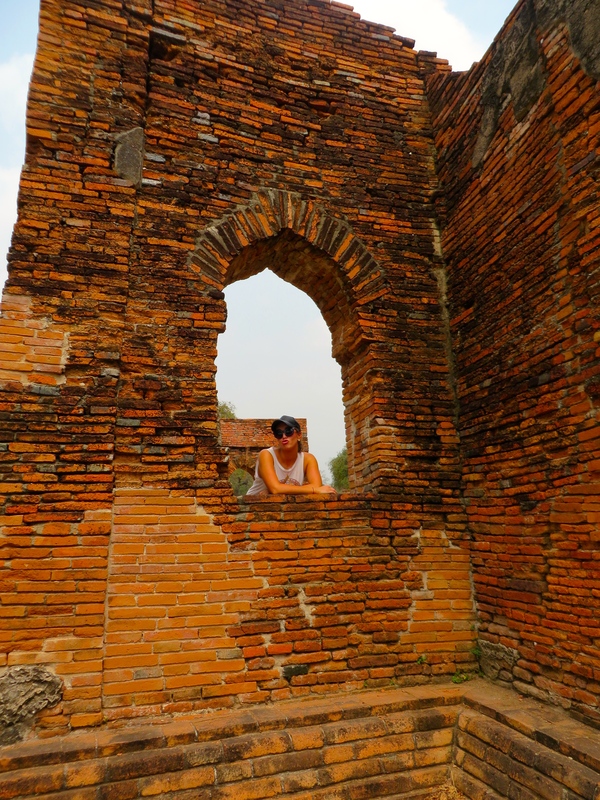 The old capital of Siam, Ayutthaya used to be one of the largest cities in the ancient world before it was razed to the ground and abandoned by the invasion of the Burmese in 1767. 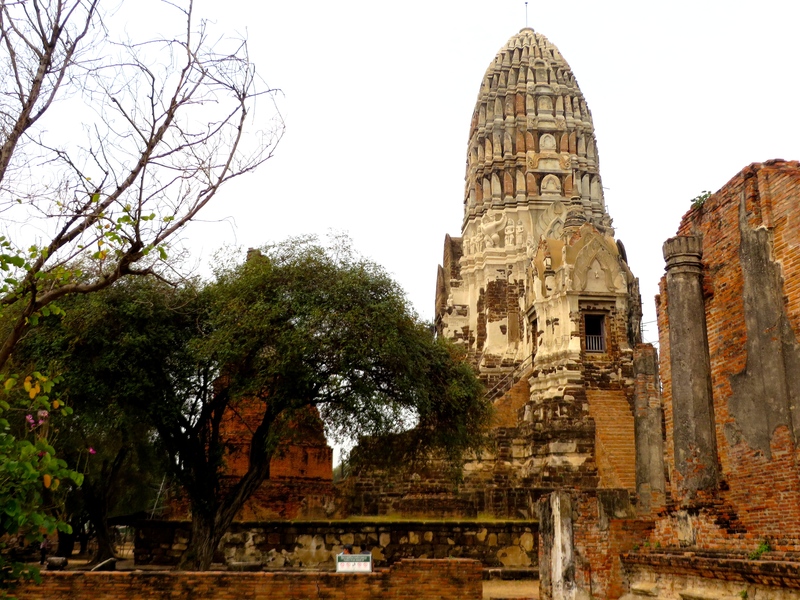 Now all that remains of Ayutthaya are centuries old ruins that have been designated a World Heritage Site by UNESCO. 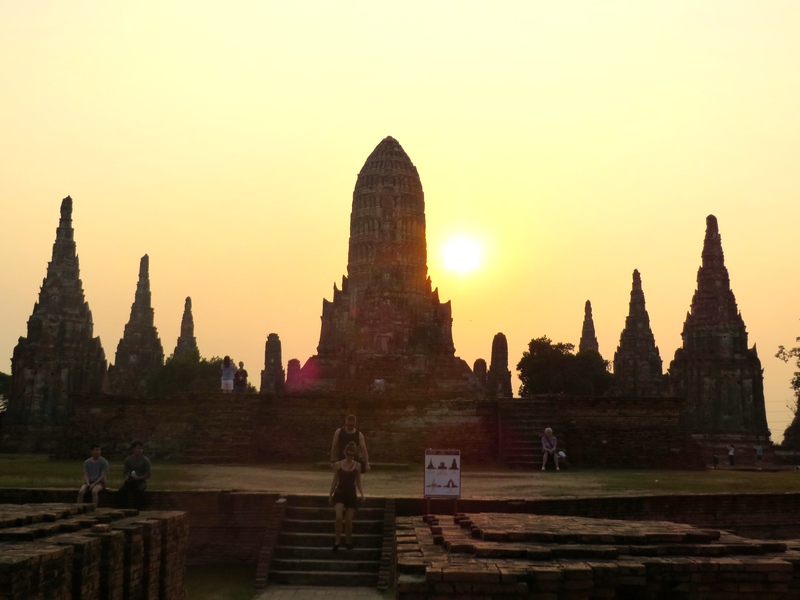 As a massive history buff and someone that enjoys exploring UNESCO sites Ayutthaya was a must see for my visit to Thailand. 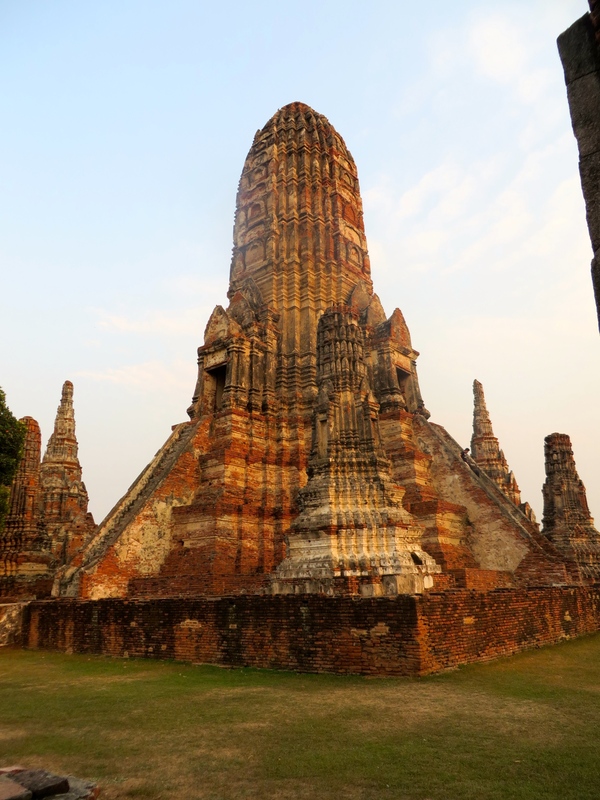 Ayutthaya is around 1-2 hours from Bangkok and is easily accessed by either a minivan from Victory Monument station or a very cheap local train from Hua Lampong station. 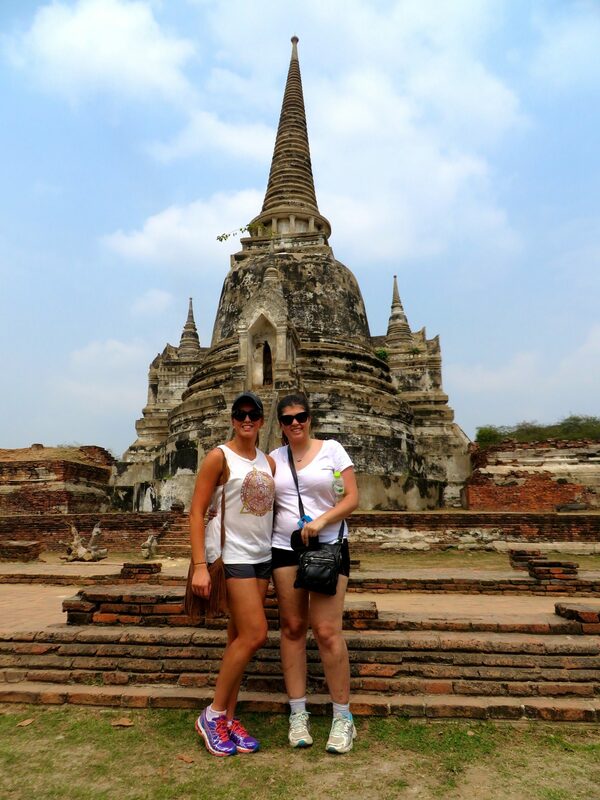 We jumped on the train with all of our bags, planning on catching the overnight train up to Chiang Mai directly from Ayutthaya that night. 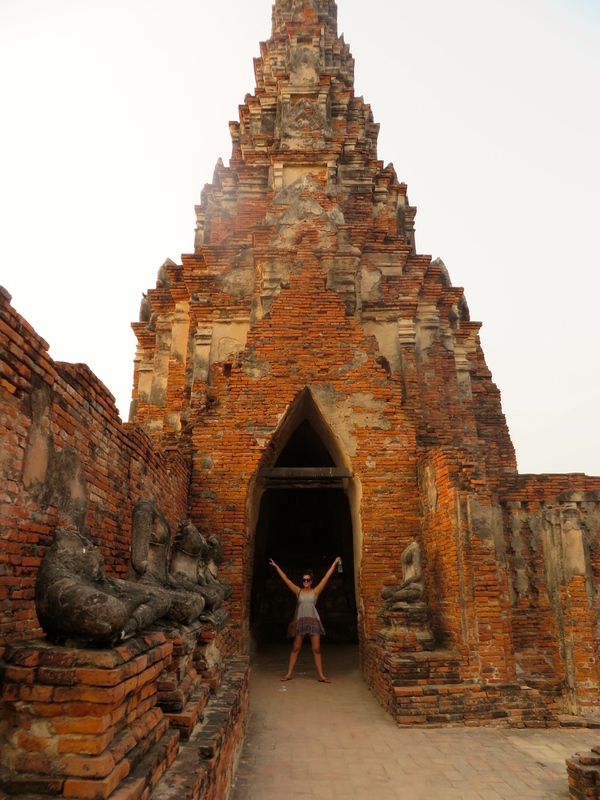 Ayutthaya is full of ruins and temples and the sheer number of them means it can be a little overwhelming when trying to work out which ones to prioritise. 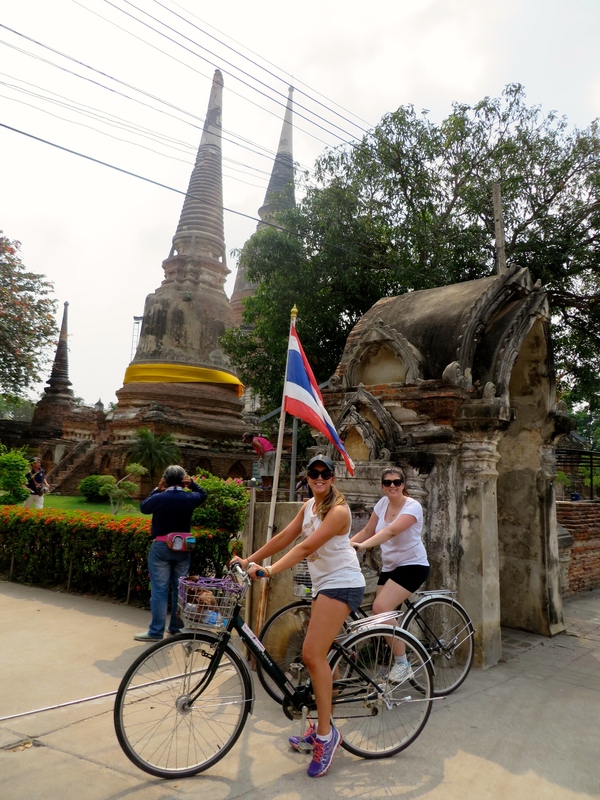 We were able to fit most of the highlights in by both hiring a bicycle for the day and exploring the ones in town, and enjoying a boat ride in the afternoon which took us to the three main temples along the riverside. 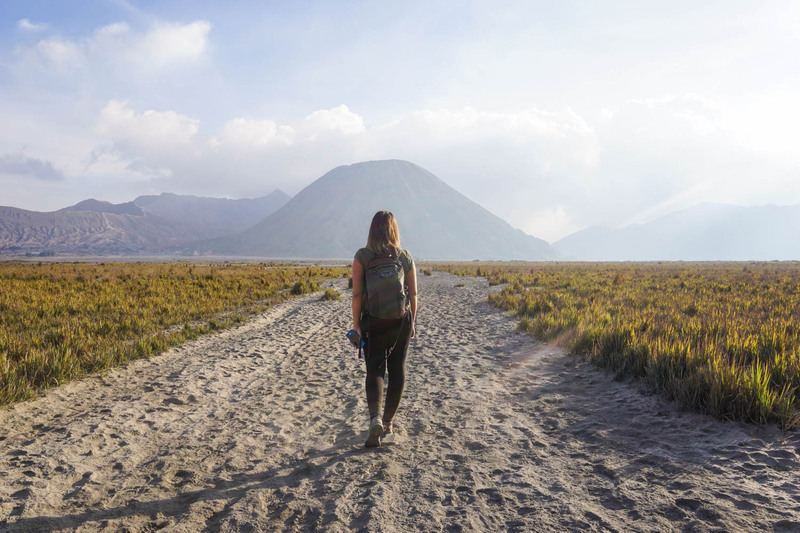 After checking in to our guesthouse which we had booked just so we could have somewhere to leave our bags and grab our shower before hoping onto the overnight train, we headed down the road to hire some bicycles. These were only 40baht for the day and an easy and fun way to get around town. We crossed the river on the little ferry to the main part of the town and made our way to the first temple of the day Wat Mahthat. 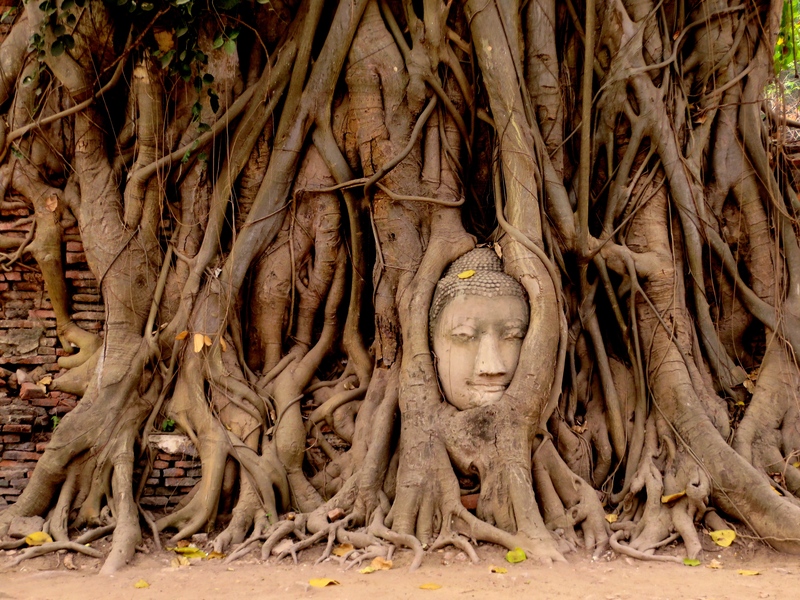 This temple is most famous for the head of Buddha in the tree. 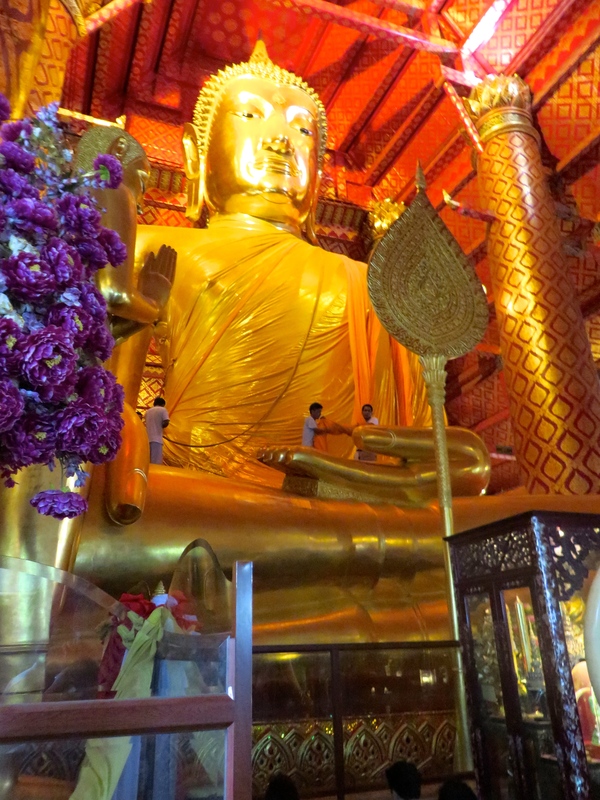 It’s one of the busier temples as bus fulls of tours arrive to snap a picture in front of the Buddha. While our first temple of the day we found this one, despite its popularity to be less interesting than the other temples we visited that day. Other than the Buddha head the rest of the temple was plainer and less intricately designed than other ones we visited. It is still worth a short visit though. 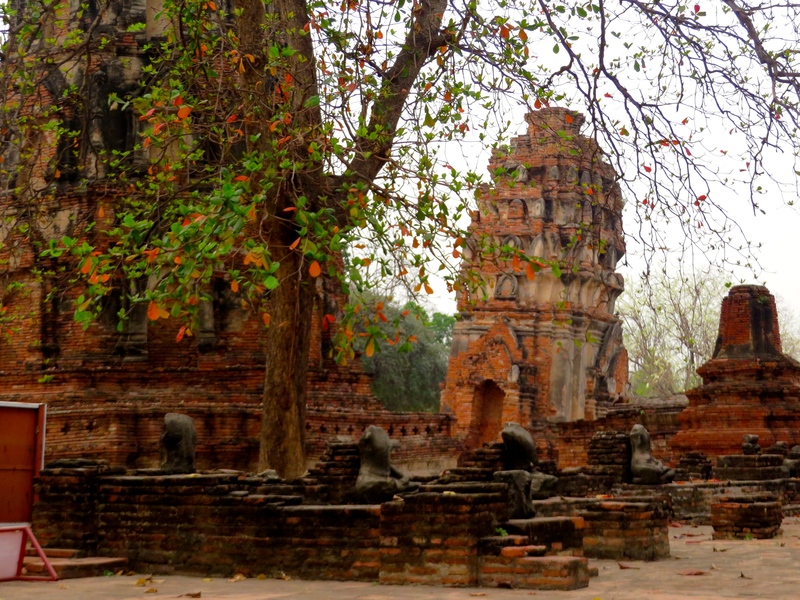 This temple was very quiet, with only a few tourists to be found exploring the site. 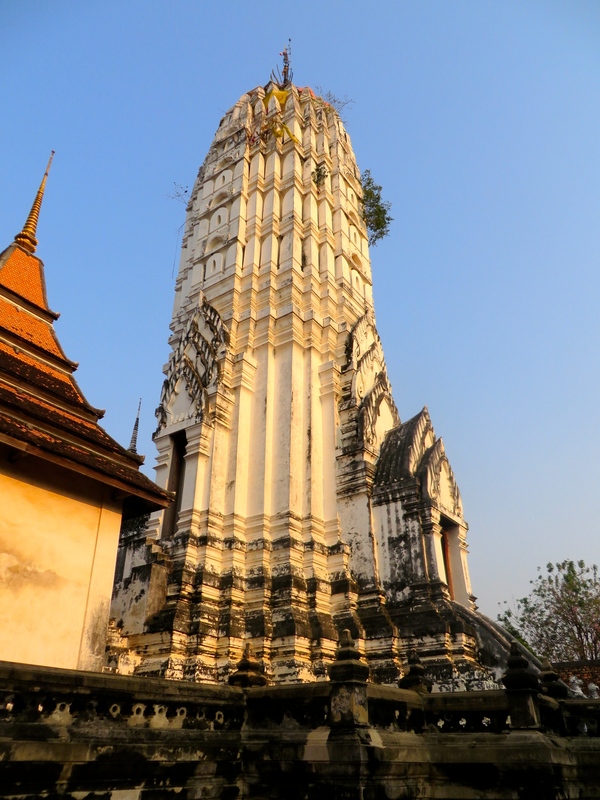 We were drawn in by the intricate design of the tower/crypt located in the middle of the site that could be seen from Wat Mahthat. Preservation work was ongoing at this site so some of the tower was covered in scaffolding but we still enjoyed exploring it. Despite being less popular Wat Rachaburana is a much smaller but really beautiful temple. 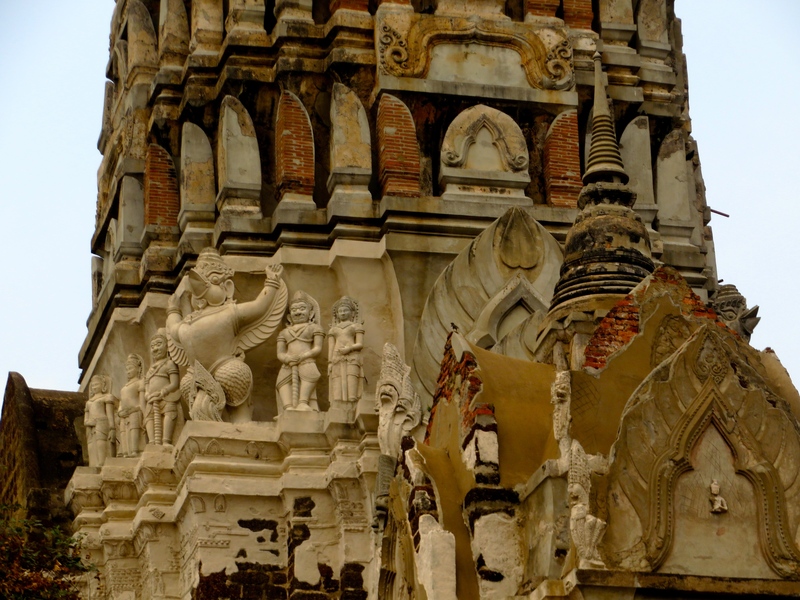 This temple is the quintessential image of Ayutthaya and the three prangs of Wat Phra Sri Sanphet are found on many brouchers advertising tours to the ancient city. This was one of our favourite temples of the day. The three towers or prangs as they are called are preserved beautifully and give a glimpse of how imposing this site must once have been. The mini recreation of what the old site looked like when first built is also really interesting. Despite the fact that the humidity was getting to us at this point we stayed for much longer at this temple than the others as it provided many interesting and beautiful buildings. This one was located outside of the cluster of temples in the middle of town. We needed to ride our bicycles back across the bridge and to the outskirts of the city in order to find it. This was a bit scary as it required us to ride along the busy road that leads to Bangkok and to go around a roundabout where we nearly got run over. However it was all worth it to see this amazing temple. This was my favourite temple of the whole day. Parts of the site are still a working temple and the combination of the old and the new was a great contrast. You can climb the largest structure in the middle where you can view the whole site from a 360 degree angle. 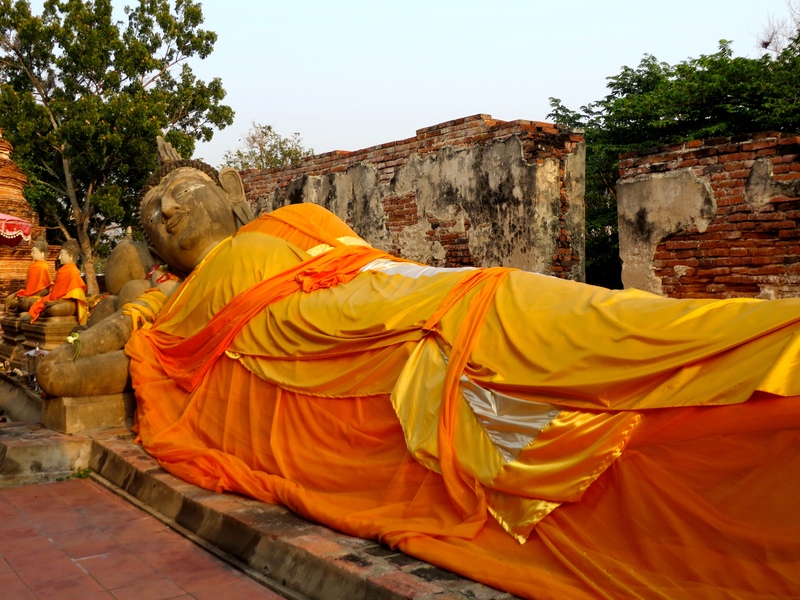 What I loved the most was all the ancient images of Buddha all wrapped in yellow cloth as is customary. While a little harder to get to, this temple is not to be missed. 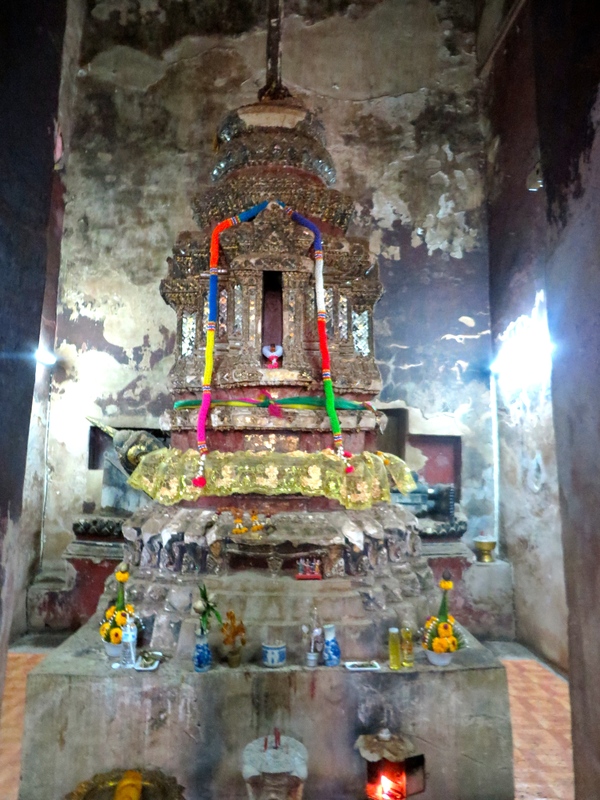 After visiting these three temples we headed back to our guesthouse to escape the heat and take a shower. Upon our arrival we had booked a boat trip that left at 4pm. This trip took us around the moat/river surrounding the city. We stopped at three of the best riverside temples where we were given 20 minutes each to explore. This is a newer temple and doesn’t have the same amount of historical ruins as the other sites. 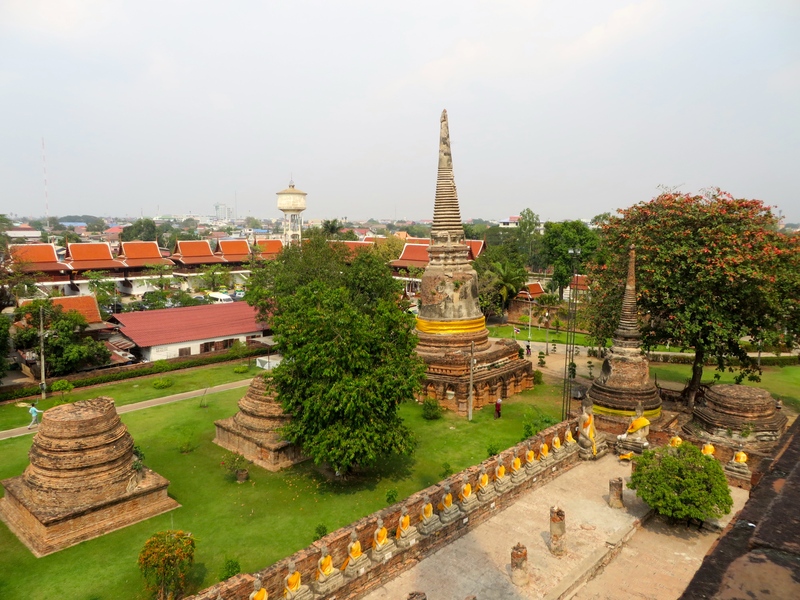 However what draws tourists to this place is the huge golden Buddha that extends all the way up to the roof of the building that was built to protect the Buddha from the elements. We arrived just as the Buddha was being dressed and afternoon prayers were occurring which made the experience even more special. I also got saturated by an old Monk with a blessing stick and a bowl of water that was having lots of fun surprising all the tourists by dowsing them in water. 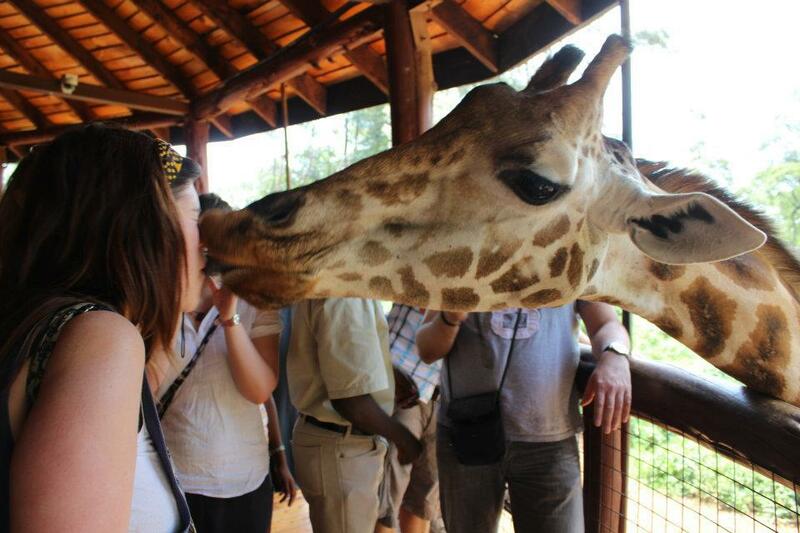 It definitely added to our experience! One of the lesser known temples, the highlight of this temple was the reclining Buddha and the white washed prang. We climbed to the top of the prang and found some awesome ancient artwork and some not so awesome bats flying around. The boat trip is timed so that you arrive at Chaiwatthanarm at sunset. It’s amazing to drive up to this huge temple site at dusk with the sun in the background. It makes for a spectacular view and an even greater photograph. This temple is definitely a must see and I think the best way to see it is by taking the boat trip and arriving at sunset. It’s made up of many amazing prangs. 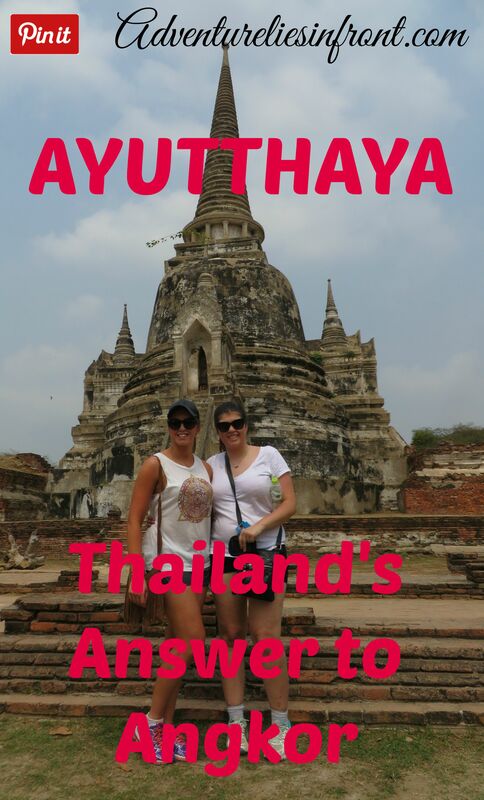 We only spent a day in Ayutthaya and managed to visit all of these amazing temples however I can easily see how you could extend your stay to a couple of days. 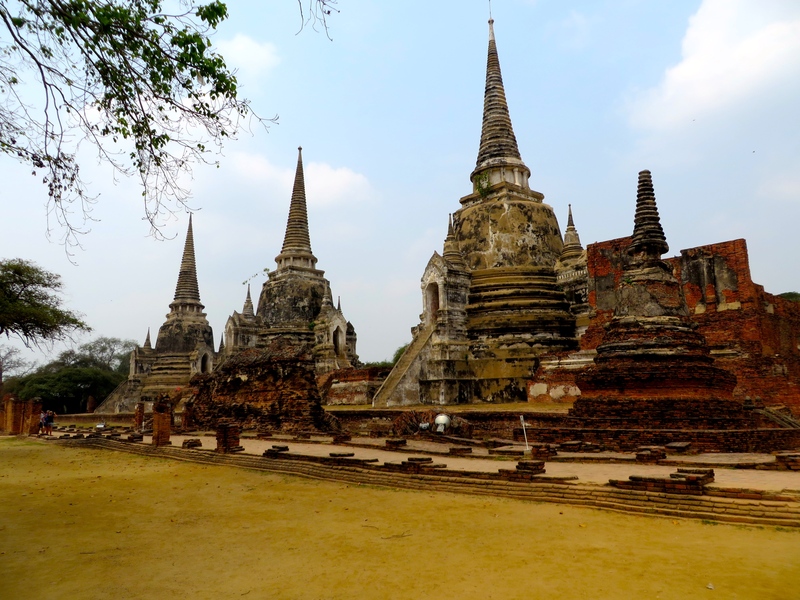 There is a more relaxed atmosphere to Ayutthaya and given the time it would have been nice to spend a little more time and visited the temples at a slower pace. We were definitely super exhausted by the end of the day which was actually a good thing as it made it easier to fall asleep on our overnight train. 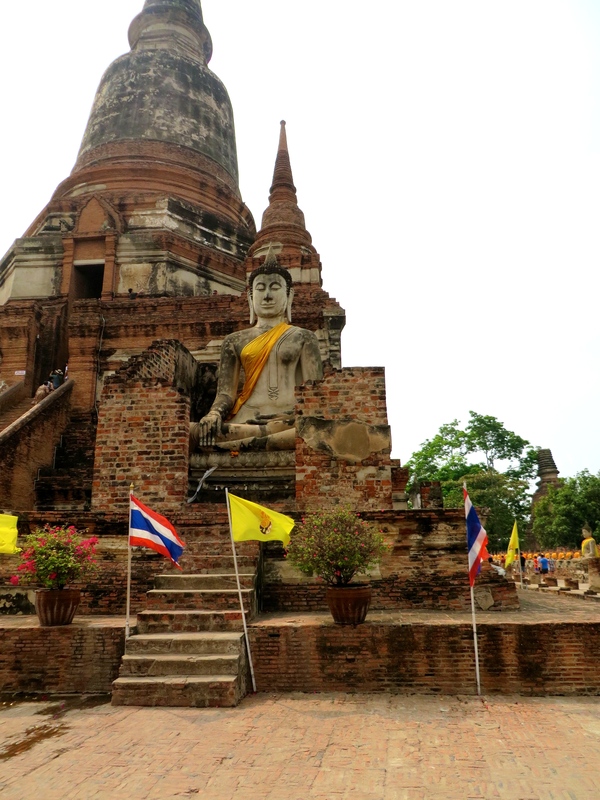 Ayutthaya can be reached by either train or bus from Bangkok, with the local train costing us about $2. 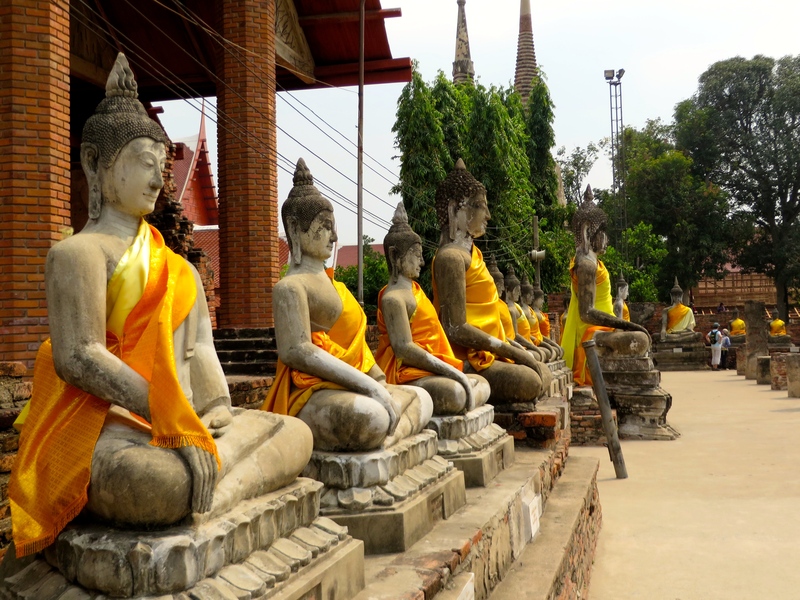 The overnight train stops in Ayutthaya on its way to Chiang Mai so it’s also possible to pick it up at this stop. 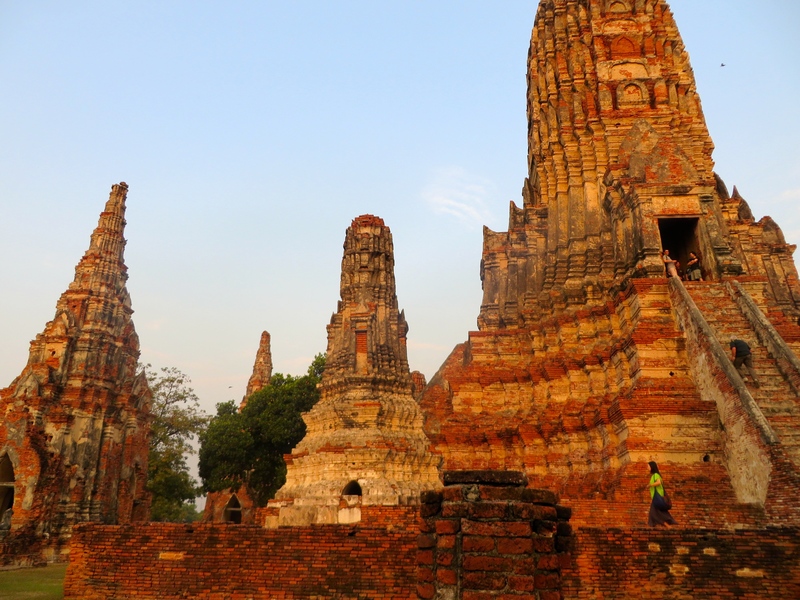 There are also local transfers to Sukhothai, another UNESCO site and ancient city. 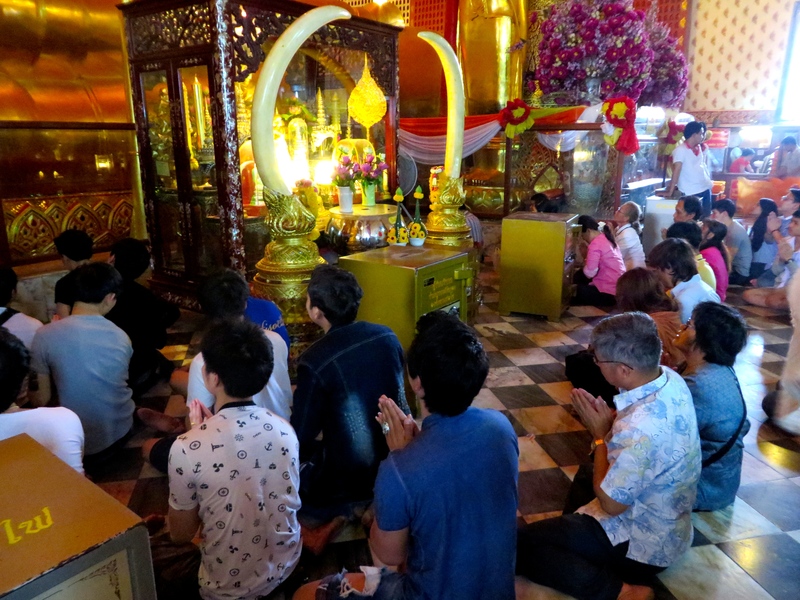 Entry to the temples costs around 50baht per temple. The boat ride costs 200baht for a two hour trip- not including entry fees to the three temples. 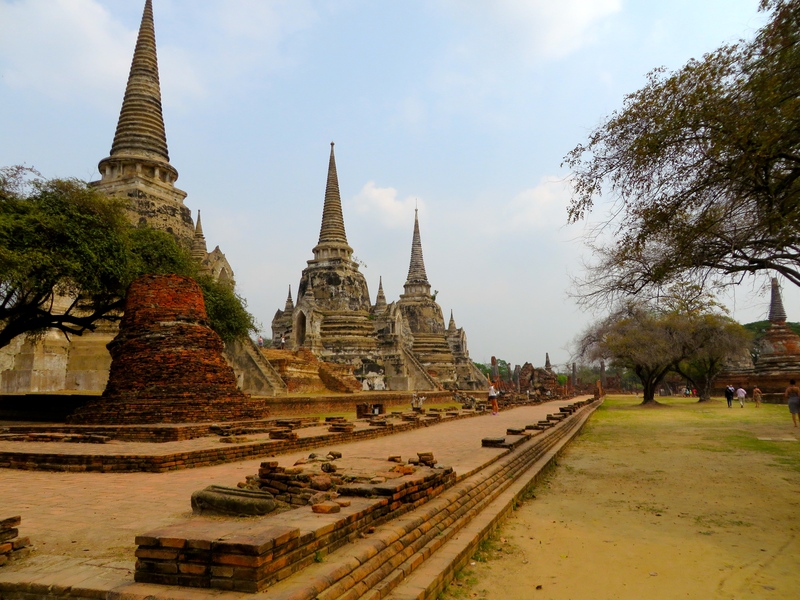 Thus it’s heaps cheaper to do this trip on your own rather than organise a guided day trip from Bangkok. Great post. Heading to Thailand soon, so this was very informative and could be useful when we get there. 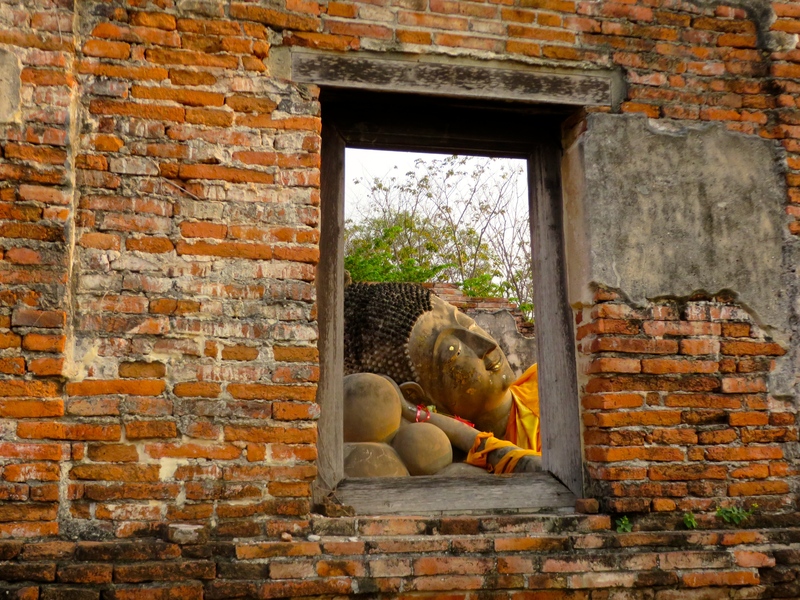 I’ve got a big backlog of Thailand posts to write- so keep following and you’ll get some more information. My biggest recommendation is to go to Koh Lanta over one of the more developed and busier islands like Koh Samui, Koh Phi Phi or Koh Phangan.